Savor the taste of summer all year round with this quick and easy low calorie chicken salad. The secret ingredient -- lemon flavored yogurt! In a medium bowl, combine yogurt and mayonnaise. Mix in blueberries (saving a few for garnish) chicken, celery, green onions and bell pepper. Mix gently. Add salt and pepper to taste. Cover and refrigerate to let flavors blend for at least 30 minutes. 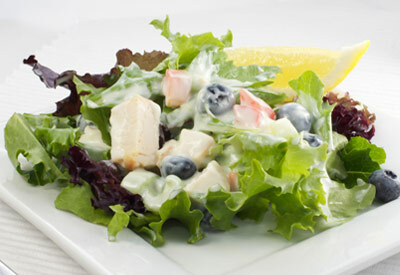 Serve over endive or other salad greens with reserved blueberries and lemon sliced, if desired.